Courtesy of ISLAND INVESTMENT REALTY LLC. You must see this one of a kind home first hand to fully appreciate its tranquil charm and beauty. Originally constructed in 1952, it has since been recently restored with many subtle hints of the past preserved. 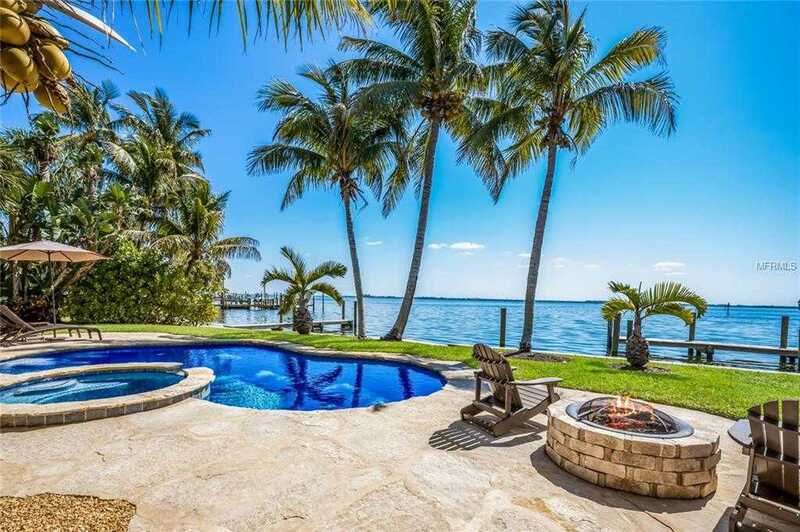 Relax on this unique parcel fronting Anna Maria Sound with 128′ of seawall and sweeping 160;water views, curvature of seawall allows for private setting with minimal neighbor influence. Home has beach cottage feel 160;with original knotty cypress wood walls and cathedral ceilings in living and dining rooms, lots of windows 160;access beautiful views, natural light and wonderful tropical breezes. Australian Cypress wood floors, solid wood cabinets and gas fireplace in living room. The views, especially sunrise, are spectacular! 13; The grounds, spacious and immaculate, include heated pool w/ hot tub, paver deck, a covered bar and grill area, fire pit, and plenty of outdoor seating. The covered and screened lanai offers even more outdoor seating. Two private docks 160;with 9000lb Boat lift plus additional boat slip provide open water access to Tampa Bay and Gulf of Mexico. Wildlife include 160;dolphin, manatee, numerous fish and seabirds that live and play 160;in the grass flats 160;beyond, and the underwater light brings everything up close for night time viewing. 13; There are three bedrooms with three full bathrooms, plus the fully enclosed outdoor shower shares a sliding glass door for easy access to the master bath. 160;Exceptional Florida living with shopping, banks, 160;dining 160;and white sandy beaches all within a few blocks. Please, send me more information on this property: MLS# A4431800 – $1,499,000 – 515 56th St, Holmes Beach, FL 34217. I would like to schedule a showing appointment for this property: MLS# A4431800 – $1,499,000 – 515 56th St, Holmes Beach, FL 34217.